After being away last weekend and having a busy week, I was feeling a bit run down. I realized that I hadn't been eating well, and also hadn't had much protein at all over the past several days. 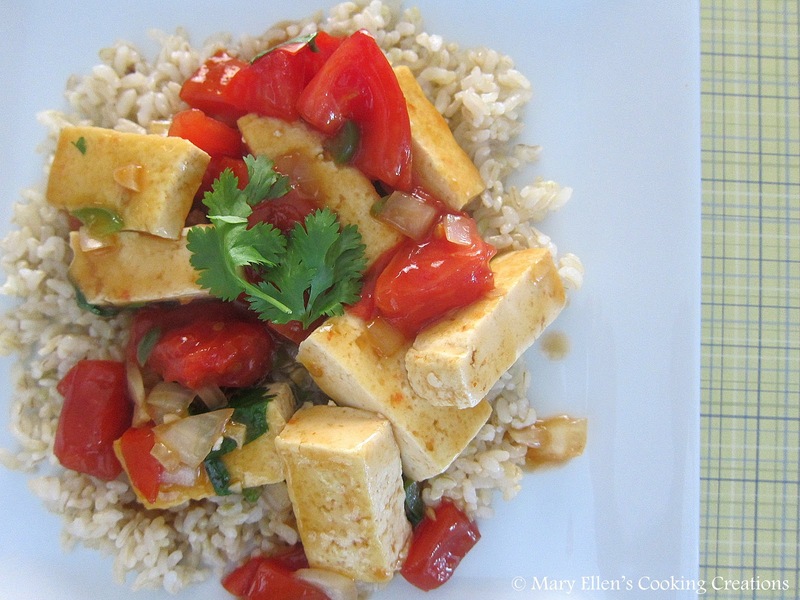 So for a quick lunch, I threw together this delicious tofu dish using things I had around - tomatoes, jalapenos, and cilantro. Sometimes these types of dishes are the best. No recipe, no set plan, just making it up as you go along. I used the entire block of tofu so I'd have enough for lunch for the next 2 days. Add tofu; cook until browned on all sides, about 10 minutes. Transfer to a plate lined with paper towels. Add a touch of olive oil to the pan. Add onions, garlic, and jalapenos. Saute 4 minutes. Add tomatoes, saute 3-4 minutes. Return tofu to the pan and add the sauce. Bring to a simmer. Add the cornstarch/broth slurry and mix well; bring to a simmer to let thicken. Toss in the cilantro and serve over brown rice. Wow great job on the blog!